The Spider™ DROP-IN™ Damper is 316-L stainless construction will withstand repeated chimney fires and will not melt like aluminum designs. The recessed design does not induce additional turbulence at the flue’s termination point or interact with the prevailing wind. All clay flue tile sizes, round single wall, flexible flue liners, class A solid pack, and air insulated factory flues are accommodated. 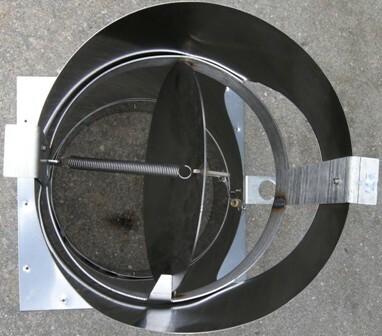 Installation is simple and damper is recessed approximately 6 inches below the flue’s termination point–ideal for restoration projects where an exposed damper is objectionable. A rain cover of your choice can now be installed over it–without fear of a freezing or sticking damper. The Spider™ DROP-IN™ Damper is the ultimate replacement for worn-out, warped and defective factory-built zero clearance dampers. Available in all round sizes: 6 to 24-inch. 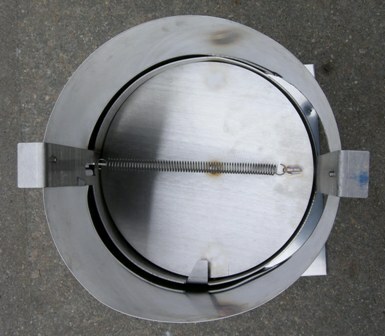 The Spider™ is now the standard damper for the Bellfires Refractory Fireplace. The new Spider™ DROP-IN™ Damper offers a spring loaded damper that will allow unlimited adjustment to the open positions of the damper. Larger sizes	available	contact	us	for	Pricing!! Spider Damper, DROP-IN™ II Spider Damper, round flue damper, flue damper, Chimney damper, round damper, round chimney damper, chimney caps, fireplace dampers, chimney cap, Lyemance dampers, custom chimney caps, chimney covers, copper chimney caps, flue caps, flue cover, turbines, chimney spark arrestor, copper vents brentwood, spider damper, spider dampers.